A full scale ISTR system was installed and operated in the former production area to treat DNAPL, the primary source of impacts to groundwater. 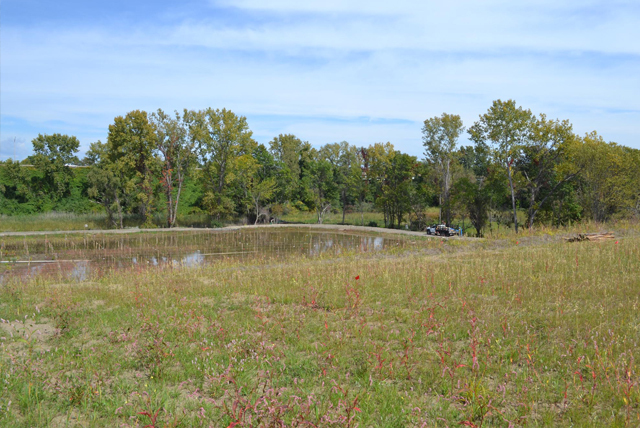 East side remedial activities are complete and ecological restoration of inland wetlands and upland meadows has been implemented. A full scale in-situ thermal remediation (ISTR) system was installed and operated in the former production area during 2015 to treat Dense Non-Aqueous Phase Liquids (DNAPL), the primary source of impacts to groundwater. The system is fully decommissioned and dismantled. Protective barriers and low-permeability covers were installed across other areas on the east side of the property prior to habitat restoration activities. Infrastructure upgrades for the site groundwater extraction system are complete. Material consolidation and regrading on the South Pile is complete and a geo-membrane based low-permeable cover system was installed prior to habitat restoration activities. The North Pile has been regraded, and a geo-membrane based low-permeable cover system was installed prior to habitat restoration activities. Sediment remediation was completed in two tidal mud flat areas in the Quinnipiac River and one area in South Creek. Pre-design investigations have been completed and engineering design proposals were approved by USEPA/CT-DEEP for the stabilization and installation of low-permeability covers over both the North and South Piles and the eastern side of the site, as well as sediment remediation of two areas of the Quinnipiac River tidal mud flats and one area in South Creek. The engineering and design of the subgrade hydraulic barrier and upgraded groundwater collection system has been completed. Installation of the subsurface hydraulic barrier wall was completed in November 2013. A pilot in-situ thermal remediation (ISTR) system was installed and operated in the former Polishing Lagoon adjacent to the former production area of the site. Construction was completed in March 2012 and the pilot system operated through November 2012. Based upon the promising results obtained during the pilot study, a full scale in-situ system was designed for installation on a portion of the west side of the property. 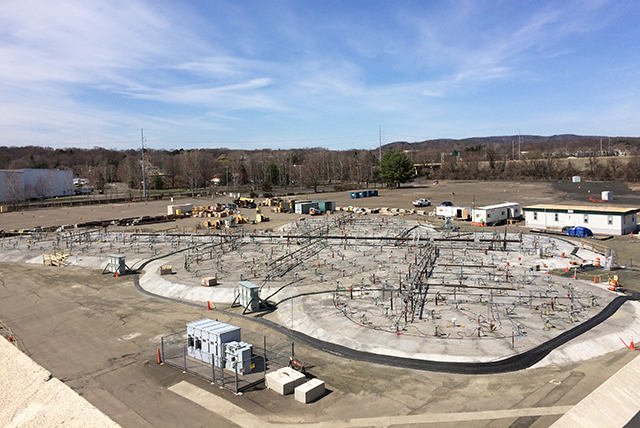 The existing groundwater treatment facility (GWTF) has been upgraded to accommodate site remedy components. Equalization tanks and other support equipment have been constructed, started-up and integrated with the existing GWTF.